Tired of solving crosswords with pen(cil) and paper? Online crossword puzzles are plentiful on the web nowadays, and once you get into them, they really are very fun and convenient. But what isn't so easy to find on the web is a nice, easy-to-follow introduction to the world of online puzzles for us old-school types. What Are Online Crossword Puzzles? It sounds like an obvious question, but there are actually two very different things people mean by 'online' and its important to distinguish them. In the first sense of online (what the purist would call the 'correct' sense), a puzzle is displayed on a web page and you solve the puzzle over the internet. Now, to solve a puzzle directly on a web page, your browser needs to know how to display the puzzle and how to let you interact with it. Usually, this means you will need to have some software called Java installed, which is frequently used by browsers to run animations. You've probably already got Java installed without realizing it. If the following puzzle displays on your screen, you're good to go! If not, you will see an instruction telling you where to click to download Java. Don't worry - it's very quick, painless, and safe. What do you think? Feel a tad addictive? In the second sense of online, a puzzle is published on the web, but you have to first download the puzzle, before opening and solving it on your computer. In this situation, once you've got the puzzle on your PC or laptop, you don't have to be connected to the internet to solve it! You can solve your puzzle on the train on the way to work, while you're waiting at the airport, or in the park over a sandwich. That's why it's not really 'online' - it should really be called 'on-screen' - but you'll still hear it described that way. Hmmm... I sure hope I'm not boring you. It's just that these are the kinds of issues that bugged me when I started out. Now, just as you need to have Microsoft Word installed on your machine before you can open and modify Word documents, and you needed Java installed before you could play with a Web-based crossword, you'll need to download and install a crossword solving application before you can process crossword puzzles without being connected to the internet. There are plenty of crossword applications around nowadays, but the one I recommend to get you started is called Across Lite. This tool is very popular in the crossword industry, so you'll have no trouble finding puzzles that work with it, and it is completely FREE. I talk more about Across Lite here. You can recognize puzzles designed for use with Across Lite by their .puz file-extension. A puzzle I downloaded from a website earlier today, for example, had the name Aug0497.puz, so I knew immediately it was a puzzle published for use with Across Lite. NOTE - Many online crossword publishers offer their crosswords in both formats. That is, you can solve them online directly from their webpage, or you can download the puzzle and solve it using your own crossword solver (usually Across Lite). NOTE - If you enjoyed the online puzzle at the top of this page, you'll probably enjoy my other Crossword Diamond puzzles. You can access these by subscribing to Word-Buff Stuff!, my free online newsletter. The online puzzle I just showed you above comes from one of the back-issues. If you want a generic way to create crossword puzzles online, for Across Lite, or in a range of other popular formats, the best tool in town is definitely Crossword Compiler. 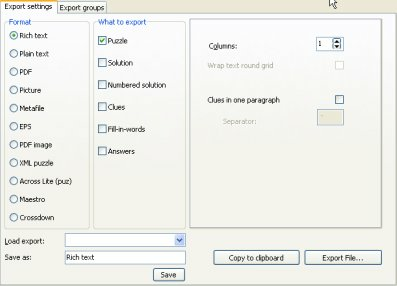 This tool enables you to create and publish crossword puzzles in a single environment and then decide whether you want to publish the puzzle to the web, make it available as a printable PDF, or distribute it in the Across Lite format. This is the application I use to create all my online crosswords here at Word-Buff.